Marshall linebacker Chase Hancock (37) chases after Miami (OH) quarterback Gus Ragland (14) during the first half of a game on Sept. 2, 2017, at Joan C. Edwards Stadium in Huntington, W.Va.
Marshall wide receiver Tyre Brady (8) hauls in a touchdown pass over Old Dominion cornerback Brandon Addison during the second quarter of a game on Oct. 17, 2017, at Joan C. Edwards Stadium in Huntington, W.Va.
HUNTINGTON, W.Va. — In a year with a large veteran presence, a single newcomer will ultimately make the biggest difference. 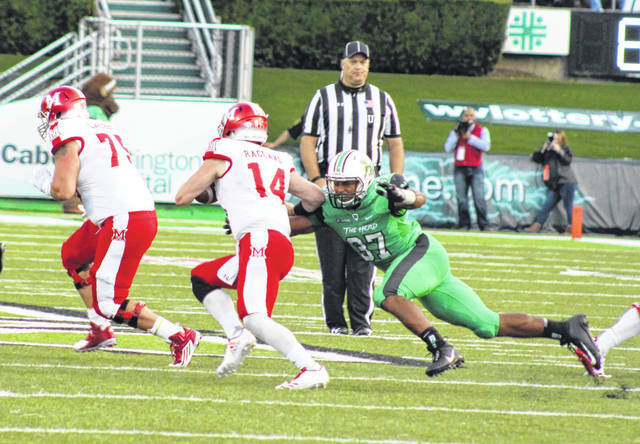 Marshall enters the 2018 campaign with experience, depth and talent on both sides of the football, but the Thundering Herd does have one very large question mark looming at arguably the toughest position on the gridiron — the quarterback spot. Chase Litton — a three-year starter under center — passed up on his senior season at MU by entering the NFL Draft, which led to him landing on the Kansas City Chiefs roster as undrafted free agent. Litton was the only quarterback under center for the Herd in 2017, a season in which the Green and White went 8-5 overall, tied for third at 4-4 in the East Division of Conference USA, and also defeated Colorado State (31-28) in the Gildan New Mexico Bowl. 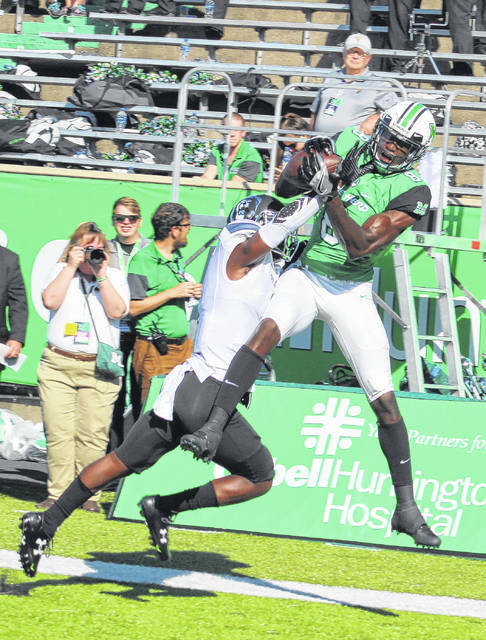 Marshall enters its ninth season under head coach Doc Holliday — who is 61-42 overall and 39-25 in C-USA play prior to 2018 — and will be operating a new offense under first-year offensive coordinator Tim Cramsey. The Herd returns their leading three rushers and six of their top seven receivers from a year ago, as well as 11 of their top 14 tacklers from a year ago. In all, MU returns 19 starters on the offensive and defensive sides of the ball. Besides the departure of Litton (3,115 passing yards and 25 touchdowns), Marshall also suffered key losses to graduation in players like tight end Ryan Yurachek (4-year starter with a team-high 10 TD grabs in 2017), kicker and punter Kaare Vedvik (led MU with 71 points, 10-of-16 on field goals and had a 44.0 punt average), and linebacker Davon Durant (6 tackles for loss, 2 forced fumbles and 1.5 sacks). Here are some breakdowns of the Thundering Herd as they head into the 2018 campaign, which starts Sept. 1 when Marshall travels to face the Miami RedHawks in Oxford, Ohio. Sophomore Garet Morrell and freshman Isaiah Green — a pair of redshirts in the MU program a year ago — join Wagner graduate transfer Alex Thomson in trying to win the quarterback position. Morrell started two games for the Herd in 2016 against Louisville and Western Kentucky, a pair of losses. Thomson produced 25 TDs and 11 INTs over three years and 24 games at Wagner. The Herd return five linemen with a minimum of six starts apiece last fall, led by season-long starters in Tarik Adams, Levi Brown and Jordan Dowrey. Nathaniel Devers and Alex Mollette finished the year in regular starting roles as well. Redshirt sophomore Tyler King (820 yards, 7 TDs) and redshirt senior Keion Davis (812, 6TDs) led the Herd in rushing a year ago and will be coming back to a group that also includes redshirt senior fullback Anthony Anderson. Redshirt senior Tyre Brady (942 yards, 8 TDs) is the primary weapon in Marshall’s passing attack, with Marcel Williams (512 yards, 2TDs), Willie Johnson (443, 4TDs) and Obi Obialo (238 yards) also returning to a receiving corps that made major strides a year ago. Redshirt sophomore Cody Mitchell is the only current tight end on the MU roster with a start to his credit, but Mitchell will be joined by Armani Levias, Devin Miller and former quarterback Xavier Gaines in battling for the massive task of replacing Yurachek. The Herd should be promising on the defensive side of the ball this year, primarily because of the experience and depth on each level of the field. The deepest part of this team sits at the linebacker spot, which will again be led by redshirt senior and 2017 Team MVP Chase Hancock (team highs of 128 tackles and 9.5 tackles for loss). Also returning are seniors Artis Johnson (55 tackles) and Frankie Hernandez (63 tackles), as well as junior Omari Cobb (37 tackles) and sophomore Jaquan Yulee (15 tackles). Junior Chris Jackson (62 tackles, led 2017 team with 3 INTs) leads the cornerback group, which also returns senior Kereon Merrell (2 tackles), junior Jaylon McClain Sapp (13 tackles) and sophomore Jestin Morrow (15 tackles). Junior Malik Gant (100 tackles) anchors a safety unit that also returns sophomores Brandon Drayton (62 tackles) and Nazeeh Johnson (29 tackles). Senior Ryan Bee (51 tackles, team-high 5.5 sacks in 2017) is back to lead a defensive front that also returns seniors Marquis Couch (41 tackles) and Malik Thompson (5 tackles), as well as juniors Juwon Young (41 tackles), Channing Hames (24 tackles) and Aaron Dopson (8 tackles). With Vedvik gone, the only experience Marshall has in this area of the game is having Keion Davis and Marcel Williams back as kick returners. The Herd has three players on the 2018 roster — junior Justin Rohrwasser, sophomore Robert LeFevre and freshman Shane McDonough — battling for the kicking and punting duties. Hyleck Foster’s graduation also leaves MU looking for a new punt returner. Marshall faces a series of road tests this year, despite playing half of its 12 regular season contests at Joan C. Edwards Stadium. The Herd opens the season at Miami of Ohio, starts Conference USA play at Western Kentucky and finishes the year at Florida International. Marshall, however, does not play in consecutive road contests and completes its non-league schedule with formidable tests at South Carolina and versus visiting North Carolina State. The Herd also hosts defending C-USA champion Florida Atlantic on Saturday, Oct. 20. Marshall was chosen to finish second in the C-USA East Division preseason media poll, trailing only Florida Atlantic. FAU received 22 of the 26 first-place votes, with the Herd getting the other four. Middle Tennessee, Florida International, Western Kentucky, Old Dominion and Charlotte completed spots three through seven in the East Division poll. North Texas received 18-of-26 first-place votes to win the C-USA West Division, with Louisiana Tech (4), Alabama-Birmingham (3) and Southern Mississippi (1) also receiving votes while rounding out the top four spots. Texas-San Antonio, Rice and Texas-El Paso completed the bottom third of the West Division poll. The Conference USA title game will be played on Dec. 1.